Welcome to another end of year retrospective on a great season of Premier League football. Here at The Ephemeric we like to use this moment to take stock of the season gone by and bestow a few carefully considered accolades. Except for last season, we don't talk about last season ever. Regular service resumed as far as the Premier League is concerned. Chelsea can hardly have been many pundits' tips for the title given their performance last season, but certainly no one would consider the success of such a prominent football club to be a shock by any means. As it happens, after a rocky start to the season Chelsea ended up coasting to victory with relative ease, leading the pack for most of the year and clinching the title with games to spare. Much of the credit needs to go to new manager Antonio Conte, whose tactical overhaul inspired an astonishing turnaround, and paved the way to a title in his debut season. This marks Chelsea's sixth top flight title, and the second in three years as the blues look to cement their status as the Premier League's premier club. As The Ephemeric predicted at the start of the season, Pep Guardiola ended up disappointing expectations at Manchester City, with a third place finish. Trophiless and only just squeaking into automatic Champions League qualification, even Pep himself has admitted that another big club would likely have sacked him after this season. Winning things is apparently not so easy when the side you've inherited is not already the best in the world. Elsewhere, Manchester United had an equally disappointing season, only managing to claw their way into the Champions League through Europa League success. However, the biggest shock of all has to be Arsenal who will miss out on Champions League football for the first time in an impressive 19 years. Arsene Wenger has found himself under immense pressure over the past year, and this disastrous season will only increase calls for his sacking. There is little doubt, it's dark times to be an Arsenal fan. Leicester City, meanwhile, surprised absolutely no one by reverting to type as a midtable side, ensuring that last season's glory will remain cemented in footballing lore as one of the biggest outliers of sporting history. But looking on the positive side, there were a number of remarkable success stories in this season's Premier League. AFC Bournemouth secured their highest ever finish in English football, while the appointment of Tony Pulis saw West Brom transformed into a vastly improved side, and a thorn of many of the league's top clubs. Probably the greatest credit of all needs to go to Tottenham who have continued their positive evolution under Mauricio Pochettino, and ended up being the closest challenger to the title behind Chelsea. Under his stewardship, Tottenham have transformed into genuine contenders, and must surely be considered among the favourites to win in the coming years. At the other end of the table it's right back down to the Championship for the newly promoted duo Middlesbrough and Hull. They are joined by rock-bottom Sunderland, a side that has consistently threatened to make the drop in recent years and have at long last run out of luck. Winners: Chelsea - A fairly comfortable victory at the end. Conte has rebuilt this Chelsea side, and the players have responded with a new lease on life. Now the real challenge begins, building a squad that can compete on multiple fronts. Relegated: Hull, Middlesbrough, Sunderland - A disappointing season for these three, though none of their relegations would have shocked any pundits' pre-season predictions. Player of the Year: N'Golo Kante (Chelsea) - In the eyes of many, Kante has been a title decider. The key part of Leicester's miraculous win last year, and now repeating the feat for Chelseas. He won't be selling shirts like Messi or Ronaldo any time soon, but football may have found its successor to Makelele at last. They'll have to start calling it "the Kante role". U-21 Player of the Year: Dele Alli (Tottenham) - In a year full of positives for Tottenham, the brightest light has continued to be the development of Dele Alli, surely England's best prospect in a generation, and well on his way to becoming a world-renowned star. Europe's big guns will come calling soon enough. Manager of the Year: Antonio Conte (Chelsea) - What more needs to be said? Conte saw something in his Chelsea side that no one else did, and pulled off one of the greatest tactical transformations of the past two decades. Top Scorer: Harry Kane (Tottenham) (29) - Kane is quickly becoming a mainstay of the top scorer's list, having competed for this honour a number of years in a row now, despite his tender years. Real Madrid are supposedly calling for his services, the question is where does Kane see his future? Most Assists: Kevin De Bruyne (Manchester City) (18) - Another Chelsea youngster sold for a relatively small amount, only for his value to multiply exponentially in the years hence. De Bruyne may have been signed for an exorbitant fee from Wolfsburg, but has flown somewhat under the radar this season. His record speaks for itself as he led the assists table for much of the year. Overachievers: West Brom - A genuine improvement under Tony Pulis. For whatever else anyone can say about the manager, he knows how to get the best out of a less than stellar side. Underachievers: Manchester City - This award could easily have gone to Arsenal, but for the money City spend, for the hype that surrounded Pep's arrival, and the expectation that they would be right in the tick of the title hunt, it's really hard to give this to anyone else. A third place finish flatters their season, where really they never felt anywhere near where they were expected to be. Best signing of the season: N'Golo Kante (Chelsea) - As above. Worst signing of the season: Granit Xhaka (Arsenal) - Despite Arsenal's reputation for frugality, they are developing something of a track record for mega-money £40+ million signings, and Granit Xhaka is the latest such signing. Despite becoming one of the most expensive transfers in the league's history, few people are probably even aware that he had even played. An anonymous first season in English football. Right Back: Cesar Azpilicueta (Chelsea) - Mr. Dependable, Azpilicueta joined an elite group of players to have played every minute of a season's Premier League. Naturally a fullback, this season he has more typically been used as the right side of the central back three in Conte's formation, occasionally filling out at Wingback. He has excelled in every role. Centrebacks: David Luiz (Chelsea) & Toby Alderweireld (Tottenham) - The consensus choice for this role. Luiz is a player reborn since he return to the Premier League, and has formed the heart of the Champions' impressive new-look backline. Toby Alderweireld was indispensable for a Tottenham side that ultimately conceded fewer goals than any other this season. Left Back: Danny Rose (Tottenham) - The second inclusion from Tottenham's excellent defence this season. Rose has been a massive boost to his side, both on the offence and tracking back to cover. Right Mid: Kevin De Bruyne (Manchester City) – As above, the man has flown quietly under the radar for a lot of people, but has been central to how his team play. Leading the assists table, De Bruyne has become the creative heart of a very talented and expensive Manchester City side. 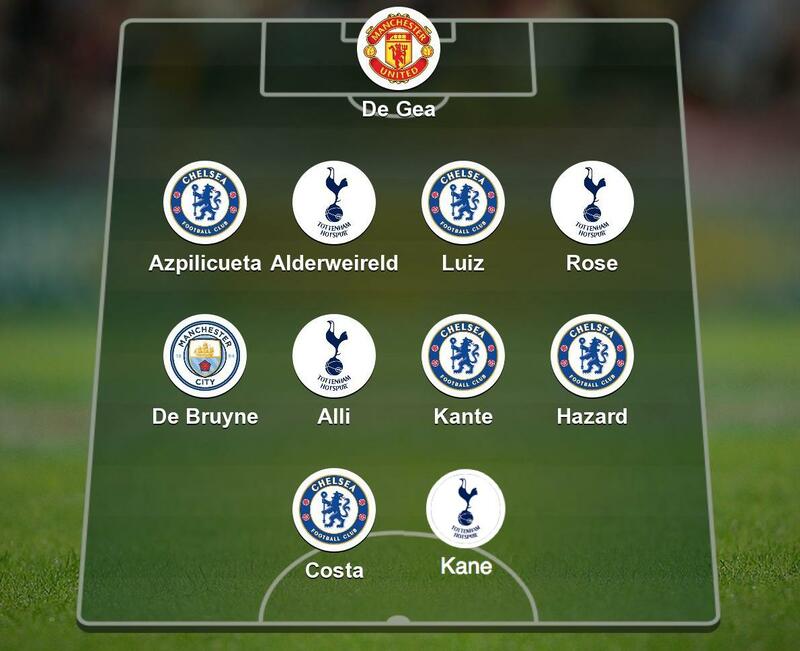 Centre Mids: N'Golo Kante (Chelsea) & Dele Alli (Tottenham) - An easy decision to make. Kante has been most pundits' choice for player of the year and rightly so, while Alli has the look of football's next big football star in the making about him. This duo in the centre of midfield would scare any opposition. Left Mid: Eden Hazard (Chelsea) – A close contender behind Kante for player of the year, and in any other season would surely have won it. Hazard has truly been back at his best, at times carrying this team to victory, and dazzling fans with technical brilliance that would make any player proud. Surely the Premier League's most talented footballer, and on current form, right up there with the best in the world. Forwards: Diego Costa (Chelsea) & Harry Kane (Tottenham) – Kane is a no-brainer as the league's top scorer this season. Costa might be a bit more controversial just owing to the public perception of the player, but the truth is there are few players in the league in any position who contribute so much to the team. He scores and creates goals, he drops deep and defends, links up the midfield, and quite frankly he plays some surprisingly brilliant football. Over the first half of the season he was arguably the league's best player, and even though his form dipped in the new year, it had very much recovered in time for the title run-in.